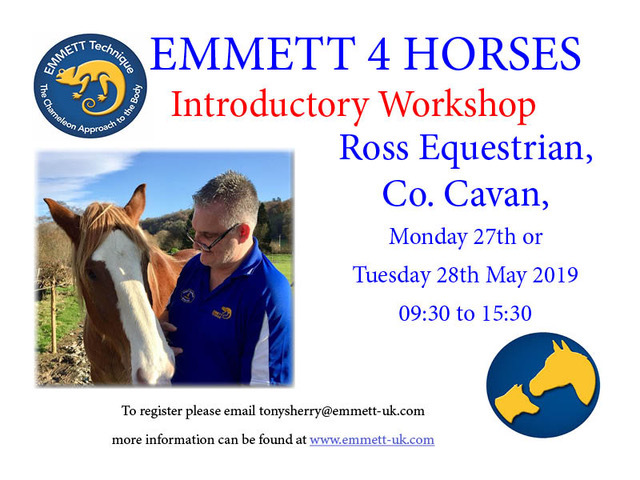 The EMMETT Technique Horse Practitioner training is designed for qualified Veterinary professionals, complementary therapists and horse owners who are interested in extending their skills. All practitioners are encouraged to enhance their existing practice by integrating the EMMETT Technique with their prior training. Equine instructors and coaches are also very attracted to this course. Undergraduates and non-therapists are also welcome to attend. Date: Monday 27th or Tuesday 28th of May 2019 – 09.30 to 15.30.